The children get to know the long-eared bats, learn some interesting facts about the donkeys, brush and stroke the animals. This is followed by a half-hour tour with riding. Back on the farm the birthday child is celebrated and the party may start with your birthday cake. Treasure hunt with donkey questions, excercise, handicraft work, Popcorn on the fire, singing songs in the straw or listening to stories. You are welcome to state your requests or you use the remaining time to do your own games. We know out of experience that the offered 3 hours are tight. You may also book an additional hour to get more time for your party (see duration). 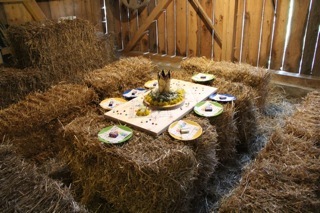 The birthday table in the straw area will be decorated by us. Plates, napkins and cups are available. (see photo above). Of cours you may also bring your own decorations in advance and prepare the birthday table yourself. Usually we offer syrup, whereat the birthday cake and/or snack is provided by you. Of course it is also possible to delegate the entire catering to us. You are welcome to combine your party with an overnight stay - for details go to lodging. to ride on the donkeys. We recommend good shoes and all weather clothing. If available, take a helmet with you, but of course we also have some riding helmets here. Insurance is the responsibility of the participants.